The learning environment is located in a large recreation room in my home. 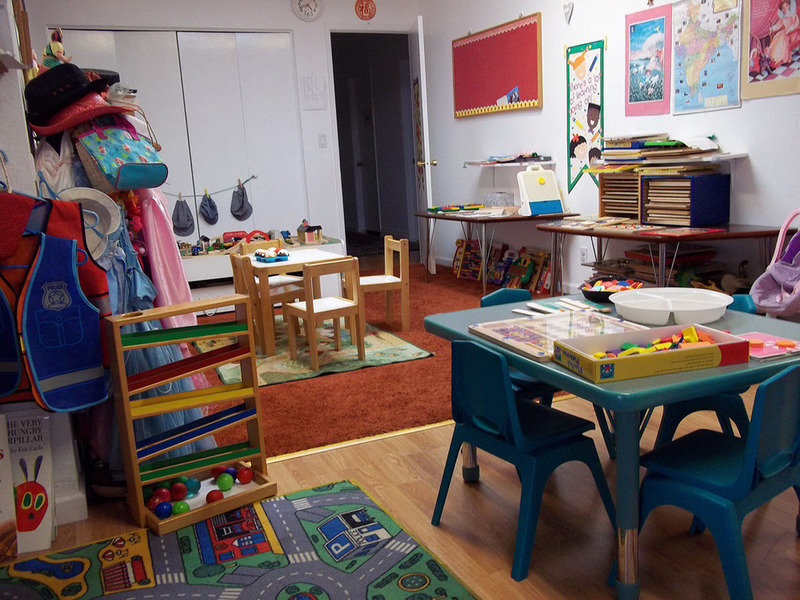 The layout is structured and designed to provide an inviting and stimulating space for children. It is set up with numerous centers (or areas for learning). Each morning playdough is laid out on our large kidney-shaped table with many tools the children to use to cut, shape, and mold with their hands for fine motor development. There is a math and language table with materials for exploration. A very popular center is the kitchen/dramatic play area where the children dress up, "cook", and serve multi-cultural dishes. Two more centers comprise tables with jigsaw puzzles and other manipulatives to promote fine motor development. There is a book corner next to our circle area. Nearby there is an art table, always accessible to the children, with materials for coloring, drawing, and cutting. Other materials, such as blocks, model cars and trucks, Tinker-toys, and other manipulatives are available to the children on easily-accessible shelves. The backyard is where we spend time with sand, water and sensory activities. As well as a rice table, there is a workbench, easel, playhouses, sandbox, a climbing structure with slide, trampoline, and monkey bar for large motor skill development plus other play equipment. Call us at (408) 255-4883 for an appointment to visit.